We keep ducks and native chickens together free range. Ducks rarely wander far from where they are fed and watered. Chickens can be more troublesome. Older roosters chase away the younger ones, hens pick fights with each other and with the ducks, killing chicks and ducklings that get caught in between. But over the years, things have become more or less established, particularly, the hierarchy amongst the fowls. 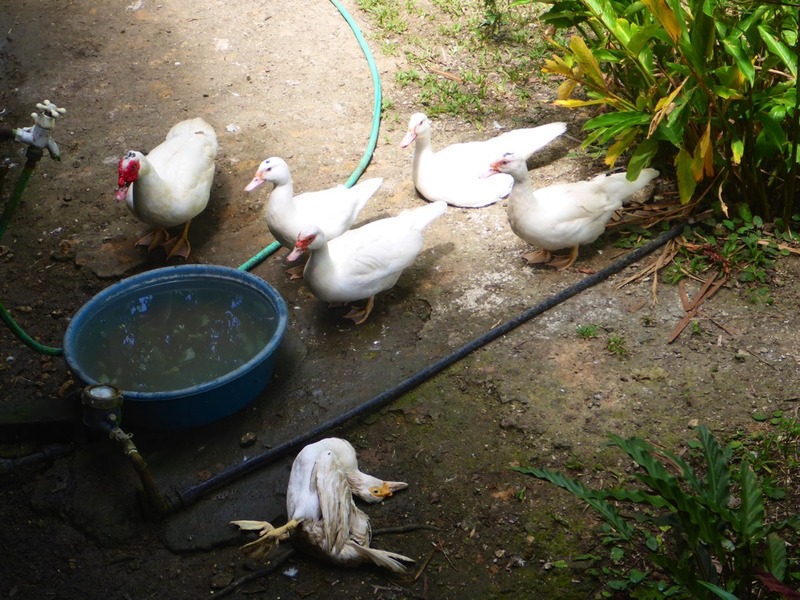 For one, there is less aggression amongst the ducks and between ducks and chickens. However, aggression amongst the chickens hasn’t really changed much, except for one thing: the ducks are putting a stop to it. In the video above, a younger rooster challenges the older white rooster to a fight. A female duck steps in to stop the fight and she gets attacked by the younger rooster. So the drake steps in and the younger rooster runs off. 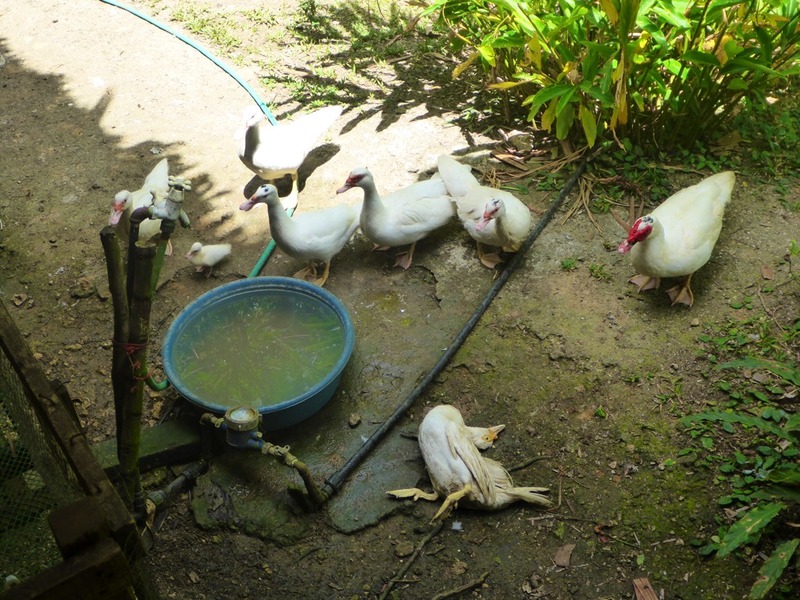 In the video above, two hens are fighting while some of the ducks look on. A female duck with 7 ducklings couldn’t stand it and decides to step in to stop the fight. The fighting doesn’t stop so she returns and manages to drive off the two hens. Several months ago, we decided to buy a pair of coloured ducks. Since all of your ducks are white (with the exception of Twisty which was given to us in exchange for one of our white ones), we thought it would be a good idea to introduce some colour into the flock. The pair are adults, mature and suitable for breeding. Because of their colour, we call them “Daffy.” They came from a farm similar to ours which allows ducks to open range. 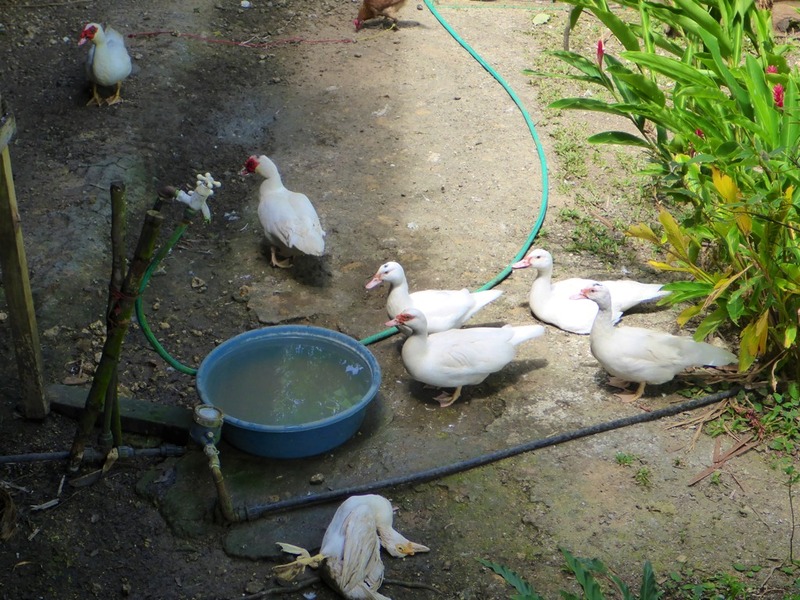 We placed them in the duck fattening pen to get them used to the new place and prevent them from escaping and returning to where they came from. In “captivity”, the pair mated and produced 11 eggs. Before the duck hen sat on the eggs, she took one egg out and broke it. This, in retrospect, was a sign of stress. Something which I should’ve addressed immediately. The eggs were laid on the ground, as ducks often prefer, in one corner of the pen. We placed a sack on one side of the pen in order to cover the eggs from view. However, the duck hen and the eggs are visible at the back and side. When the duck hen sat on the eggs, we took out the drake to prevent him from forcibly mating her. Our alpha drake, Daddy Duck, encountered this new drake, danced along with him and started a fight. The new drake was easily subdued. This ritual, which would take place again in the next couple of days, established the hierarchy in the flock. After such, there was peace and order. In the meantime, the duck hen dutifully sat on her eggs and I thought it was fine. Until after 35 days when the eggs hatched in the late afternoon, the nightmare would become apparent in the early morning. I heard cackling noises from the fattening pen, the type of noise made by ducks when they are angry. 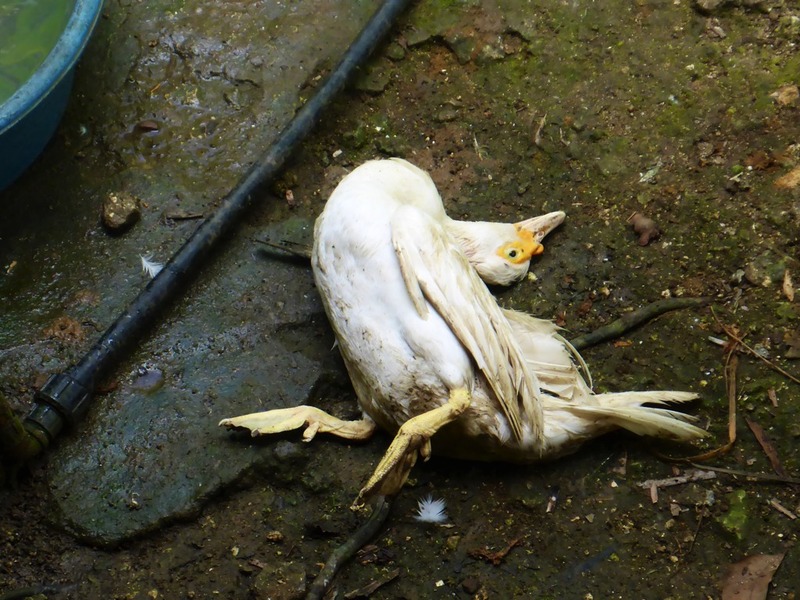 When I looked, I saw the massacre of ducklings. Two ducklings still inside their eggs were pecked to death, two ducklings were crushed in the nest, five ducklings were found dead outside the pen as if desperately trying to run away from something. I found one duckling still alive, placed it in a box with a heating lamp but it died within a few hours. 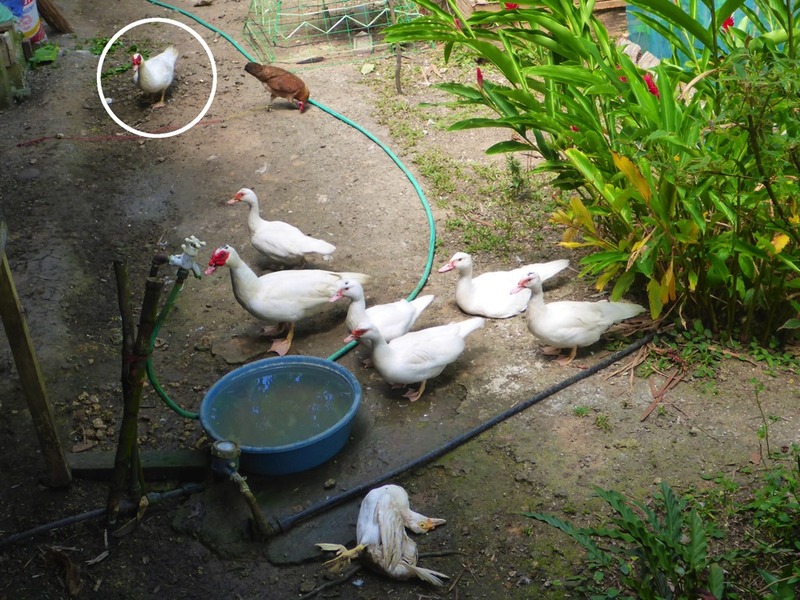 The duck hen, new to the environment, surrounded by unfamiliar people and ducks, was deeply stressed and threatened, prompting her to break one of her eggs and thereafter killing all her ducklings. I am yet to become familiar with signs of stress in ducks and I did not see this until too late. The duck hen has since been released with her mate and all the other ducks. Both are doing fine. We provide shelter and nesting covers for our ducks and leave it to them to choose where they would like to nest. The drake has sired one duckling as seen in the latest hatchling, and we hope he will have more. The duck hen, in the meantime, has not yet laid new eggs. Perhaps later, in her own time and place. If the behaviour of breaking eggs and killing ducklings persist, the duck hen will need to be culled. Our ducks learned to dance sometime before the drought. This is behaviour so far observed only amongst a few of the younger (less than a year old) female ducks. I associated this behaviour with the drought. Third week of May it finally started raining heavily. And the ducks are still dancing. But not as often as before. I just feel grateful that the long dry spell has finally been broken. Over the past several weeks temperatures have been reaching a rather uncomfortable 35°C – perhaps not too bad if you live in a nipa house surrounded by trees. For now, it’s 29°C at high noon and probably will be raining later in the evening. Shortly after feeding the ducks this afternoon, I noticed this unusual behaviour amongst a couple of mature female ducks. These are mature egg-laying duck hens. They have just finished eating when they began to mimic the sweeping motions of feeding with their beaks. Here are two videos showing this peculiar behaviour. The second video shows the ducks stretching their necks, moving their heads upwards. I assumed it was part of a mating ritual but the first video might dispute this, where there is a mature male duck (drake) nearby, drinking from a plastic basin, and inadvertently pushing one of the duck hens aside, a bit of a scuffle ensuing. Do you know what this behaviour means? I was able to spend some time with the ducks and take these photos before it started to rain. Do Ducks Know How to Grieve? Or as we humans define it, “feel intense sorrow”? In early 2015, I saw the oldest drake in a group of about 15 ducks forcibly mating with a female duck of about the same age. I have read in various literature on ducks that the mating behaviour of ducks can be quite violent. So I assumed, despite the distressful appearance of the female duck, that what was happening was quite normal, just the way of nature. Besides, the ducks are free-range, so ducks can flee when they are threatened by other ducks. Unfortunately, in just a matter of minutes, I saw the female duck lying dead on the ground and the drake walking away. It was horrifying! I couldn’t believe it. I felt sorry and upset that I was wrong in thinking that the female duck would be alright. A small group of ducks begin to gather near the dead one. Then some five minutes later, I saw a group of ducks converge near the dead duck. The female ducks were the first to gather, followed by the second (younger) drake. Soon, the ducks positioned themselves near the dead duck, looking on as if they were grieving. A most curious behaviour of ducks gather near the dead duck, looking on, as if grieving. This went on for about fifteen minutes until the older drake, the culprit, arrived. The other ducks looked at him. The culprit arrives (encircled in the photo) and the others take notice. Twenty minutes had passed when the young drake began to confront the older drake, causing the other ducks to slowly disperse. The younger drake confronts the culprit and the group begins to disperse. That same day, I decided that we must cull the older drake. With him around, there had been constant fighting and forceful mating. Such behaviour not only distress the ducks but have also killed younger ducks that got caught in the fight. This decision to cull turned out to be a very good decision. At the moment, we have two drakes that service some 10 female ducks. The two drakes also get along very well with each other, the older teaching the younger one about mating and looking after the females. It is necessary to cull in order to stop unnecessary stress in the duck population. Posted on September 13, 2015 Categories The DuckeryTags culling, duck behaviour, violent matingLeave a comment on Do Ducks Know How to Grieve?